I shared my tomato avocado salad a few weeks ago and I’ve gotten so many emails and Instagram tags from you guys, telling me how much you enjoyed it! So today I’m sharing another delicious avocado salad. 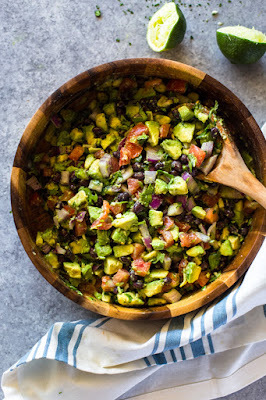 This salad is loaded with black beans, avocado, tomato, onion and cilantro. It’s my tex-mex twist on the classic avocado salad so adding corn, olives, or minced cucumber will make a great addition! The salad is dressed in an olive oil, garlic and lime dressing and the lime helps keep the avocados nice and vibrant green. If you’re making this the night before, dice up everything else and add the avocados and dressing the last-minute. If you’ve never had an avocado salad before, this is a great way to try it. Avocados are packed with hearty healthy monounsaturated fatty acids, fiber and antioxidants. Eating avocados can also lower cholesterol levels and help you lose weight! In a medium bowl, combine avocados, tomatoes, onion, black beans cilantro and dressing. Gently toss until everything is coated. Serve immediately or cover with plastic wrap for up to 12 hours.